Large Greek salad & cup of soup. Cup of soup with ham, turkey, or tuna sandwich. Served with tomato, lettuce, & cottage cheese. With marinara sauce for dipping and French fries. Five skins loaded with real bacon and cheddar cheese. Served with tzatziki sauce. Two mozzarella sticks, two pizza logs, three chicken fingers and onion rings with marinara sauce for dipping. With pita bread for dipping. 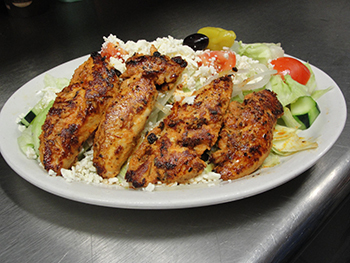 Tender, seasoned chicken served with pita bread & a fresh Greek salad. Deep fried chicken breast, topped with lettuce, tomato, mayo, bacon, and Swiss cheese served atop a fresh sesame bun with French fries. A blend of seasoned lamb & beef served with pica bread & a fresh Greek salad. A triple decker! 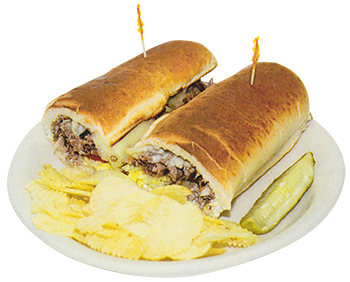 Loaded with beef, cheese, fried onions and pepperoncini. Served with French fries. The veggie version of our souvlaki. Served with pita bread. Four pieces of fried chicken with fries or macaroni salad. Tender, 8 oz. seasoned strip steak, served on toast, with your choice of potato and garnish. Golden fried chicken tenders, served with fries or macaroni salad. 8 oz. charbroiled chicken breast with spinach and Feta and Greek dressing served atop a fresh roll with French fries. A delicious Sahlen's hot dog topped with mustard, onions, and our own Texas hot sauce. 6 oz. seasoned burger, topped with lettuce, tomato, and Feta cheese. Served with fries. 4 oz. burger topped with lettuce, tomato, and mayo and served with potato chips. A third pound burger topped with lettuce, tomato, mayo and onion and served with potato chips and a pickle. 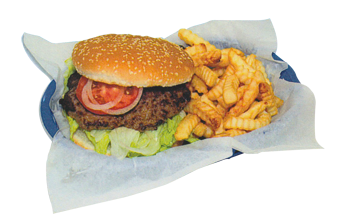 A third-pound burger with lettuce, tomato, onion and mayo. Served with french fries. 6 oz. seasoned burger, topped with bacon, lettuce, tomato, mayo and American cheese. Served with fries. Served with fries. All wraps made with your choice of white or wheat (extra charge) pita bread. Served with French fries and a pickle. With extra tzatziki in the wrap, or on the side, add $.75. Your choice of beef, chicken, or gyro meat wrapped in a warm pita bread with lettuce, tomato, onion, Feta and fresh tzatziki sauce. Wrapped in a warm pita bread with lettuce, tomato and mayo. Golden chicken tenders, wrapped in a warm pica bread with lettuce, tomato, onion, and Cheddar cheese. Grilled chicken wrapped in a warm pita bread with fresh spinach, Feta cheese and tzatziki sauce. Lettuce, tomato, onion, Feta cheese and tzatziki sauce. Tuna wrapped in a warm pita bread with lettuce, cheddar and onions. Smothered in peppers and onions. Chicken Patty with Swiss cheese. 8oz. fried bologna steak topped with fried onions. Spinach, Feta and Tomato in grilled pita. All subs served with Provolone cheese, lettuce, tomato, onion, and oil or mayo. Accompanied by potato chips. French fries may be substituted for 0.49. Served with potato chips or French fries and a pickle. Slices of top round roast beef smothered in our homemade gravy. Fresh made meatloaf served with homemade gravy. Delicious roasted turkey smothered in homemade gravy. Savory pork roast topped with homemade gravy.